Several notable Japanese swimmers made their marks on this year’s Japan Student Championships, a swimming, water polo and diving tournament that has been running for 93 consecutive years. Among the men’s teams, Meiji University took the overall team title, followed by Waseda and then Chuo. For the women’s side, it was Nihon University who earned the top prize, with Toyo and Chukyo Universities finishing in 2nd and 3rd place, respectively. Top male competitors over the course of the 3 days included reigning 200m breaststroke world record holder Ippei Watanabe, who won his pet event in a time of 2:09.26. Watanabe turned heads early this year by establishing a new world standard time of 2:06.67, becoming the first man ever under the 2:07 threshold. The young 20-year-old followed that up with a bronze medal at this year’s World Championships, finishing behind newly-minted European record holder Anton Chupkov and teammate Yasuhiro Koseki, clocking a time of 2:07.47. 2016 Olympic silver medalist Masato Sakai did his thing in the 200m butterfly event, taking the final race in a solid time of 1:54.54, marking the 4th consecutive title for the Waseda University athlete. That result proved quick enough to take gold, but only by less than a tenth as Nao Horomura touched in 1:54.63 to take silver. For Horomura, the 18-year-old’s time is within range of the 1:53.90 time he crushed en route to 200 fly victory at the World University Games just last month. 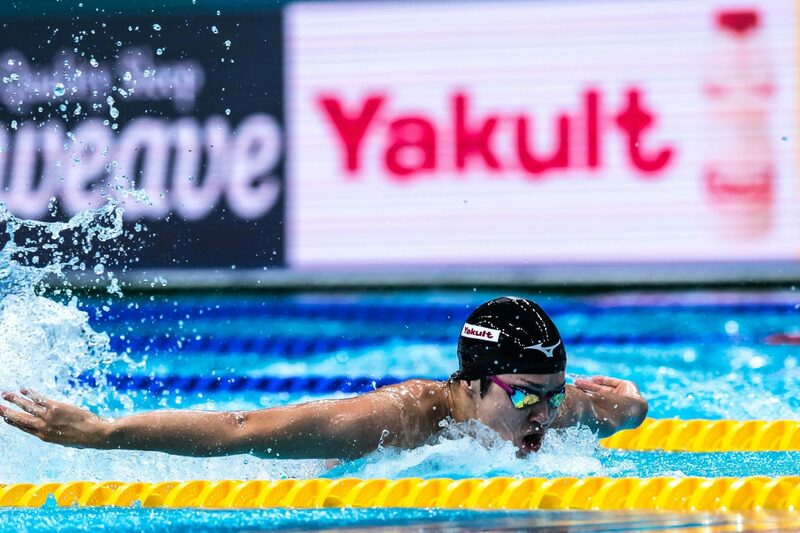 Okayama University’s Nakao Shuichi fired off a new meet record to take the men’s 50m freestyle, earning gold in a quick 22.02, while 2015 200m breaststroke World Champion Kanako Watanabe claimed gold in that event’s final in a time of 2:24.22. World Championship silver medalist, Yui Ohashi, who finished less than a second in the women’s 200m IM in Budapest behind Hungary’s Katinka Hosszu, won that same sprint IM event here, taking the title in 2:10.33. Also making waves for his respective university was Katsuhiro Matsumoto, who won the men’s 200m freestyle in a time of 1:47.56. That exceeded the 1:47.92 mark he mustered in Budapest, which resulted in 27th place overall. Why can’t the Japanese sprint? While not totalitarian, they’re on average much shorter than the rest of the world. The average man from Japan is 5’7.25″. In the USA, 5’9.5″. Netherlands is 6’0.